MacSpeedZone has posted a performance review of the PowerBook G4/550 compared to the PowerBook G4/500, when running OS X 10.1. The 550 MHz machine has a 100 MHz system bus, a slightly higher processor clock speed, a 256K full processor speed on-chip L2 cache, and a faster graphics system with 16 MB of dedicated graphics memory. The 500 MHz machine also has a 100 MHz System Bus, but in place of the 550's on-chip cache it has a 1 MB backside cache running at half the processor speed. It also has a slower graphics system and only 8 MB of graphics memory. MacSpeedZone notes that "the lack of a large backside cache in the newer 550 MHz PowerBook stunts its performance in some tests, when compared to the older 500 MHz PowerBook... so the overall performance of the new low-end PowerBook is somewhat mixed, both when running under Mac OS X and when under OS 9." 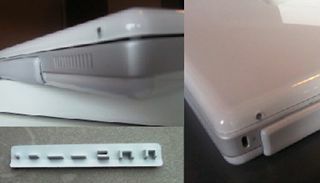 The Portector is a custom molded urethane strip that fits snugly over the expansion ports of your Apple iBook protecting it from dirt and dust. It's soft, flexible, and matte finish nicely compliment the laptop. The price is: $12.50 US/$19.75 Cdn. plus shipping and taxes. My daughter arrived home for the Christmas holidays and fell in love with the Willow Kerouac "NotePack" backpack laptop case that Willow's Nigel Peck recently forwarded for review. "Too nice for high school," she commented, admiring the Kerouac's amazing array of compartments and pockets, "but next year for college - and it's black too!" Black is Deordre's favorite color for clothing and accessories. Kerouac is the original, and most popular, model in Willow's NotePack line, which includes five other, different-dimensioned versions called Thoreau, Darwin, E. Carr, Somerset, and Jacques, to accommodate various-sized laptops and various-sized people. If the Kerouac doesn't fit your needs, one of the other models surely will. The Willow NotePack series are specifically designed to accommodate a PowerBook G3 or G4. The standard configuration fits the older G3 PowerBooks like my Pismo and WallStreet, and Willow can custom configure dividers to fit the Titanium G4 for those wanting a deeper laptop compartment for their TiBook. It takes some time to explore the Kerouac's features. There are 10 (if I counted correctly) separate compartments and pockets. My review Kerouac is black, to my daughter's delight, with a tasteful bright blue accent, but the product also comes in charcoal, navy, teal, and purple. The outer or back lid section of Kerouac is a pack in itself, containing a net pocket with two wide, nylon straps secured by Velcro closures. There's also a second, zip-closure net pocket on the inside of the padded outer cover. On the outside of the cover are two more zip-closure pockets - the outermost one non-padded, while the inner one has a nylon divider pocket with sleeves to hold pens, pencils, and other small gear, sandwiched between the two layers of the cover padding. The inner, main compartment has double-zipper closures. At the very core of the pack is a well-protected compartment for the PowerBook, with more nylon, Velcro-fastening straps. Movable and removable Velcro-secured padded bolsters facilitate adjusting the computer aperture to accommodate different sized laptops. At the bottom of the compartment there is a zip-closure, nylon, bag-type pocket ideal for power cords and USB or FireWire cables. The top or front of the main compartment incorporates a fairly large half-moon-shaped section suitable for carrying power adapter bricks and other, larger accessories. The inner face of the padded outer lid (which incorporates the other compartments and pockets previously described), is yet another zip-closure net pocket. The Kerouac NotePack is not just a backpack, but also converts to a briefcase or shoulder bag. The left-hand side of the pack has a padded briefcase handle, attached with polypropylene webbed straps fastened pack with stitching and rivets, which also attach hook anchors for the case's detachable padded shoulder strap. A large fabric flap hides and secures the backpack harness when the Kerouac is in briefcase or shoulder bag mode. Velcro closure makes popping the harness out for backpack mode easy, and there is even one more pocket underneath the harness. A waistband is included for anchoring the Kerouac to keep it from flopping when doing serious roadwork. The Kerouac sells for $132 US/$196 Cdn plus shipping. It weighs 3.2 lb./1.45 kg., and is suitable for airline carryon (both Under Seat and Overhead). Willow offers a 100% satisfaction guarantee and a lifetime product guarantee. I love this laptop pack, but I'm going to have a hard time holding onto it when Deirdre heads off to college next fall. MCE Technologies's Lucid is an 8x8x24x Portable FireWire CD-RW Drive. The Lucid CD-RW is claimed to sport the slimmest dimensions and lightest weight of any FireWire CD-RW drive on the market today, as well as a sleek industrial design intended to complement all of Apple's current system lineup, particularly the Apple PowerBook G4 Titanium. The Lucid CD-RW is powered entirely by the FireWire bus and features JustLink buffer under-run protection. MCE will begin shipments of the Lucid CD-RW drive immediately. "The Lucid CD-RW drive represents the pinnacle in our quest to join form with function," said Arnold Ramirez, President, MCE Technologies, LLC. "Not only does the Lucid perform exceptionally in the portable arena due to its diminutive size, weight and other portable features, but it's striking design meshes seamlessly with Apple's distinct industrialized style." The Lucid 8x8x24x Portable FireWire CD-RW Drive writes recordable CDs at 8x speed (1200 KB/Sec), writes rewritable CDs at 8x speed (1200 KB/Sec), and reads regular CD-ROMs at 24x speed (3600 KB/Sec). It does so while weighing in at only a pound and measuring 5.5" wide, 6.5" long, and only 0.8" high. The Lucid also features JustLink buffer under-run protection to prevent the creation of defective CDs due to interruptions in the flow of data to the Lucid drive. The Lucid CD-RW Drive does not require an AC adapter, as it draws all required power from the FireWire port to which it is connected. The Lucid supports all PowerMacs, iMacs, PowerBooks, and iBooks with built-in FireWire ports as well as those with PCI FireWire cards which supply power to the FireWire bus. An AC Adapter (available separately) is required when using the Lucid with those systems whose FireWire ports do not supply power to the FireWire bus, such as CardBus-based and some PCI-based FireWire ports. The Lucid is compatible with Apple's iTunes under Mac OS 9.1 through Mac OS X. Compatibility with Finder Burning under Mac OS X is forthcoming. The Lucid is compatible with Roxio's free Toast 5 Titanium for OS X, Preview Release #2, downloadable from Apple's web site, for the creation of data CDs under Mac OS X. Note below 333 MHz Lombards have now dropped below the $1,000 threshold for the first time.